The guts and the grit displayed by the US Federal Reserve this week went largely unnoticed in Australia. The RBA has a lot to learn from Jerome Powell of the US Fed at that art of real economics . While the RBA still wants to keep the juice flowing with low interest rates – the US Fed has in spite of strong criticism from POTUS has gone ahead and raised the official interest rates. That is a big deal at a time when the yield curve went negative and a stock market running sh*t scared. The markets have been way too long fed on easy money and its got addicted to it . While the need for de-addiction calls for a rehab time out , the US Fed is unwavered by the tantrums of a spoilt child(stock markets). Meanwhile in Australia the Bank Bill Swap Rate (BBSW) – which governs the inter bank funding cost has been rising(please refer to the below pic) .With the US rate hike done and dusted , there is higher chance of the BBSW going up in the coming weeks. With more being that 40% of mortgage funding $$$ in Australia coming from the US wholesale funds market – the flow on effect cannot be avoided. At time when saving rates are at a record low in Australia , the rate hike in the US will add to costs of an already cash strapped Australian banking system. The Australian banks already battered by the BRC(Banking royal Commission) will have the contend with higher BSBW and falling house prices. The only silver lining for the banks has been the holding up of the AUD at the 70 cent mark.Any further slide in the AUS will push up the USD balance owed by Australian banks. Since the last time(Aug 29, 2018) that westpac and others raised rates – there has been 2 rate hikes from the US Federal reserve(Sep 13 and Dec 19). No doubts that there has to be flow on effect on Australian mortgages.Time will tell when the Australian banks will end up having to raise rates again. Unlike the last 12 months or so — this time around the situation is different .The BRC is over and the chances of negative publicity of rate hikes has waned. The banks will be feeling more confident this time around in addressing their balance sheet than other issues. This is the next best thing after Microsoft Azure Relay to connect or expose your on-premise resources to the cloud. In the case of MS Azure Relay it remove the reliance on opening ports in the enterprise Firewall to expose WCF endpoints to the external world. 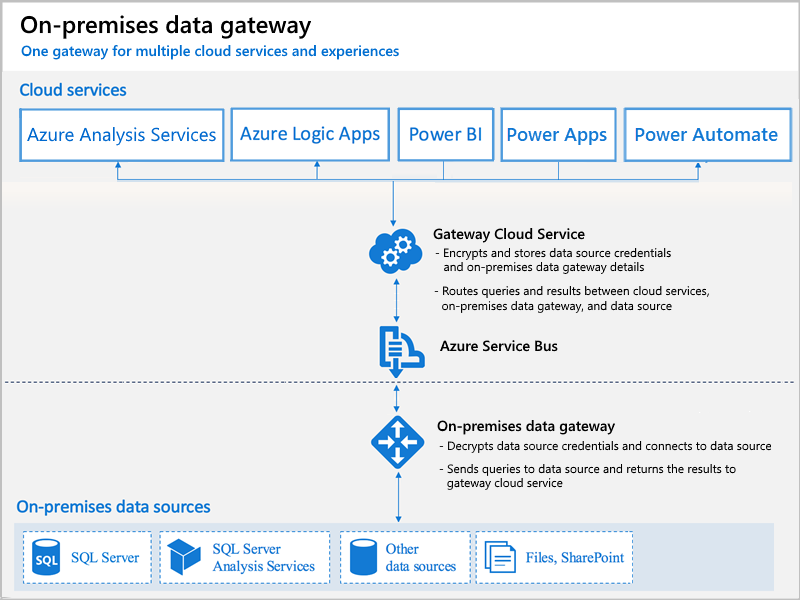 The Azure On-Premise data gateway takes a step ahead and embeds a software into the server that has the database (that the enterprise wishes to expose) . The good part of the Azure On-Premise data gateway connection is that there we have the option to select ‘Azure Service Bus’ connection or ‘Non-Azure Service Bus’ connection , albeit with a performance cost attached -since performance suffers with Azure Service Bus connectivity . The advantages with the Azure Service Bus connectivity is that we have the various options within the service Bus see Service Bus queues, topics, and subscriptions and Relay.The gateway acts as a bridge between the cloud and your on-premises server. Data transfer between the cloud and the gateway is secured through Azure Service Bus. The Service Bus creates a secure channel between the cloud and your on-premises server through an outbound connection on the gateway. It is recommended that you whitelist the IP addresses, for your data region, in your firewall. You can download the Microsoft Azure Datacenter IP list. This list is updated weekly. The gateway will communicate with Azure Service Bus using the IP address along with the fully qualified domain name (FQDN). If you are forcing the gateway to communicate using HTTPS it will strictly use FQDN only, and no communication will happen using IP addresses. There still remains the firewall connectivity and configuration that requires to be setup. Service Bus is a brokered, or third-party communication mechanism. This is similar to a postal service in the physical world. Postal services make it very easy to send different kinds of letters and packages with a variety of delivery guarantees, anywhere in the world. Service Bus supports two distinct messaging patterns: Azure Relay and Service Bus Messaging. The core components of the Service Bus brokered messaging infrastructure are queues, topics, and subscriptions. The primary difference is that topics support publish/subscribe capabilities that can be used for sophisticated content-based routing and delivery logic, including sending to multiple recipients. These components enable new asynchronous messaging scenarios, such as temporal decoupling, publish/subscribe, and load balancing. For more information about these messaging entities, see Service Bus queues, topics, and subscriptions. The DPID is the Australia Post, Delivery Point Identifier. This is an 8 digit number that is unique to every address in Australia, generated by validating against Australia Post’s PAF (Postal Address File). Once all the addresses have been verified the application opens the destination excel sheet and writes the result to it. My tryst started with creating a simple MVC application for adding and editing data for our cleints. Also the editing / adding and deleting of data was possible using modal popup. Demos dont tell us about linking to a database table. Returning a JSON with var variable.